Excuses and complaining aren’t going to get you more time on the court even if they’re justified. You must focus your energy on the things that are in your control. These things in your control include: your attitude, the amount of shots you make every day, your fitness level, etc. You must understand that earning more playing time is not something that’s going to happen overnight. You can’t implement a few of the tips I’m about to share with you and expect that you’re instantly going to get an extra 10 minutes a game on the court. It will take time. You need to keep working hard, working smart, and focusing on the tips below. If you do this your opportunity will come. Even though this article is focusing on increasing individual playing time, when it truly comes down to it you must always want what’s best for the team. The team is always the number one priority. Even if you believe you’re unfairly stuck on the end of the bench you should always be cheering and encouraging your teammates during games. You should always be the first to rush over and help a teammate up after they’ve taken a charge, always make the extra pass and pass up a good shot for yourself for a great shot by a teammate. Make your teammates better. Don’t be a player that cares more about their individual stats than the success of the team. Attending every practice is the first step to prove to the coach that you’re committed to the team and you’re serious about improving your abilities as a basketball player. If you start to miss a few practices here and there without a valid explanation, not only will the coach notice, but your game will show it too. All great coaches have a practice outline that progresses throughout the season. If you miss a couple of practices in a row you might find you’ve missed out on learning crucial plays or offensive/defensive concepts which can put you at a severe disadvantage compared to your teammates that attended. If something unavoidable comes up that forces you to miss practice, make sure you call your coach as soon as you can and let them know that you won’t be able to attend. A common mistake players make is sitting back and assuming they know why they’re not receiving much playing time. Don’t take the risk that you’re wrong. Set up a meeting with the coach or ask them for a few minutes of their time before or after practice or whenever it’s most convenient for them. This can be a tough conversation to have depending on the attitude of the coach of your team and their opinion about playing time. In my opinion, coaches should always be open to discussing playing time with their players and parents of their players as long as it’s done appropriately. There are some coaches out there that flat out refuse to have discussions about playing time and I think it’s a complete disservice to their players. But do remember, when having this conversation, players and parents must be willing to accept what they might not like to hear. During the conversation you must make sure that the questions you ask aren’t coming across as aggressive or being asked with a poor attitude. Don’t speak with an angry tone and remember that your body language says just as much as your words do. 1. What can I do to help the team? 2. What areas of my game do I need to improve on? 3. What’s holding me back from getting more minutes on the court? 4. What do you think my strengths are as a player? Asking these questions will prove to the coach that you do want to help the team and are committed to improving your game also. Coaches love players that know their strengths and weaknesses and adjust their game accordingly. If you’re a post-up big man, halfway through the fourth quarter of a close game is not the time for you to work on your outside shooting. During practice and individual workouts is when you should be improving your weaknesses. The main skill that relates to knowing your game is shooting and your shot selection. Where can you make shots consistently from on the floor? If you find yourself constantly shooting from spots you aren’t comfortable from, it won’t be long until you’ll be sitting extended minutes on the bench. To further prove the point, this is why some big men who can’t make a shot outside of the paint to save themselves often lead the league in shooting percentage. The only time they shoot is when they’ve got a layup or a dunk. They understand that they can’t shoot from outside so they don’t do it. Once you’ve worked hard enough in practice to develop your shooting and can consistently make a shot from a certain range, only then should you be taking that shot in a game situation. Games are constantly won and lost by only a couple of possessions. A player who makes tough plays like these can get a team an extra couple of possessions every game. If games are constantly decided on only a couple of possessions, what coach wouldn’t give a player like that extra minutes every game? Do you look like you want to be part of the team when the coach is explaining something at practice? Do you look interested in the basketball game when you’re on the bench? Or are you slouched back in your chair with your mind wandering somewhere else? Sure you can look around the gym and while the coach is talking and clearly hear everything they’re saying, but do they know you’re listening? Show the coach you’re listening by keeping eye contact whenever they’re talking. Look engaged. Don’t give the coach a reason to believe you’re not listening. Coaches love players that are coachable and willing to learn. That all starts with eye contact when the coach is talking. If you’re working really hard on your game then the opportunity to contribute will come at some point. When it happens you must be ready to make the most of your opportunity. Prove to the coach that you’re deserving of extra minutes on the court. Don’t sit on the sidelines when you should be warming up because you know you’ll only play a couple of minutes. Prepare for them to give your best effort when you’re on the floor. While the game is on make sure you stay intuned in the game from the bench. Work out what the opposition is doing and how you can best play against them given your strengths and weaknesses. Is there a better way to earn more playing time than becoming a better basketball player than the teammates you’re competing against? Understand that it’s difficult to increase your time on the court without improving your ability to contribute while you’re on the court. This means you can’t work out half-heartedly… if you want extra minutes on the court you’re going to have to work really, really hard on your game. The biggest problem you’ll face is lack of motivation due to your lack of playing minutes. Players have to stay confident that the hard work they put in will pay off and their time will come. Get to practice early and stay back late. Don’t just muck around in that time, really focus and work on improving. Take game shots from game spots and game speed, work on your dribbling skills, anything that’s going to improve you as a player. Tip: Coaches DO notice who’s getting to practice early and staying back to get in some extra reps.
Talk to your coach and find out what they think your weaknesses are and how you should best go about improving them. If you’re a poor shooter, put time into your shooting with these shooting workouts. If your ball-handling should be improved, check out these dribbling drills. Give 100% throughout every single practice and the same goes for when you’re working out individually. Prove to the coach with your work ethic that you’re deserving of more minutes on the court. Just like everyone else, coaches do hold grudges and play favorites whether they like to admit it or not. Some coaches more than others. Sure it probably won’t be obvious on the surface, but you can guarantee the coach is always playing favorites in the back of their mind. Not liking the way you talk to your parents. Bullying other players on the team. Not contacting them when you won’t be at practice. Answering back to the coach. If the coach then faced with the option of subbing in the kid they like or the kid they don’t like, who do you think they’re going to choose? It’s harsh but it’s true. Don’t give the coach a reason to hold a grudge against you. I’ve seen plenty of good players that have their minutes reduced simply because they didn’t have the level of fitness required to stay on the court for an extended period of time while continuing to be productive. The same goes for individual players. A well conditioned player that is able to go 100% mentally and physically will received more minutes than a less conditioned player of the same ability. When players are tired they commit silly fouls, don’t box out, don’t sprint back on defense, take bad shots, and other similar things that will put their team at a disadvantage to win the game. Coaches don’t want tired players on the court. Some ways you can improve your fitness are through your diet, improving your sleeping habits, jumping rope, and running sprints. Sounds simple enough, but many players fail to do it. In order to get more minutes on the court you must understand who it is that allocates the minutes and determines how much playing time you receive every game… the coach. It’s not your parents, brothers and sisters, or your friends that you have to impress with your play, it’s the coach. If your coach is telling you not to shoot the ball from three and your father is telling you to shoot the three, who do you think you should listen to? If your coach is telling you to crash the boards on every possession, get in and do it! Do everything you can to make the person that decides your minutes happy with your play. The awesome thing about striving to become a great defender is that there’s not much competition. Every player want to shoot three’s. Everyone wants to score 30 points a game. But no one wants to put in the effort to hold an opposing player that averages 25 points to 10 points. If you want extra minutes on the court, you should be that player. Coaches understand the importance of having a great defender at their disposal better than most. It’s a luxury to have someone that you can call upon to go out and limit the oppositions best scorer or slow down someone that has got hot during the course of the game. Holding the opposing teams best scorer to 15 points below their average is as beneficial to the team as you scoring 15 extra points. The best ways to become a better defender is simply to guard the best players you can find. If you’re playing a pick up game, take on the strongest opponent and try your best to limit their scoring. One on one games are also great for improving individual defense. Especially if the player you’re playing against is better than you! 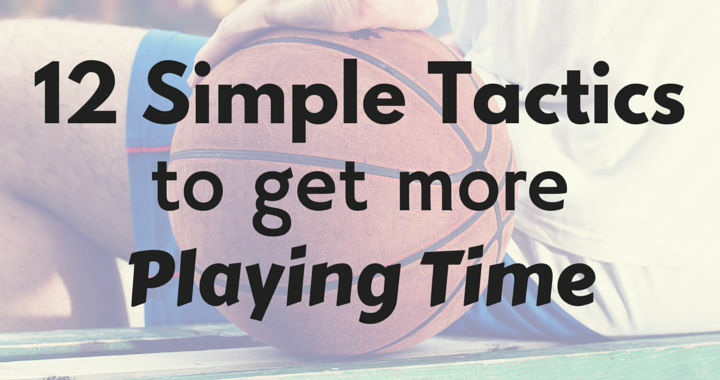 How will managing your time get you more minutes on the court? Because the number one excuse I hear from players who don’t often work out individually is that they can’t find time to do so! These players need to start managing their time better. Coaches are fully aware of how busy players lives can be. With multiple sports, education, employment, homework, and everything else, they have a lot to fit into every week! I always recommend to my older players that they start scheduling their time each day. If they dont, there will be a lot of wasted time on tv shows, xbox, and other unproductive things. Don’t get me wrong, these activities are fine in moderation, but based on what I’ve seen, most players spend far too much time on them. While improving all other areas of your life, starting a schedule will show you where the free hours are in your day in which you can start really working on your game! By following these 12 tactics players can definitely work their way towards increasing their playing time. 2. Talk to the coach. 4. Be willing to do the dirty work. 7. Work really, really hard. 8. Don’t give the coach a reason to not like you. 9. Improve your level of fitness. 10. Listen to the coach. 11. Become a great defender. 12. Improve your time management. What other tactics can players use to increase their playing time?